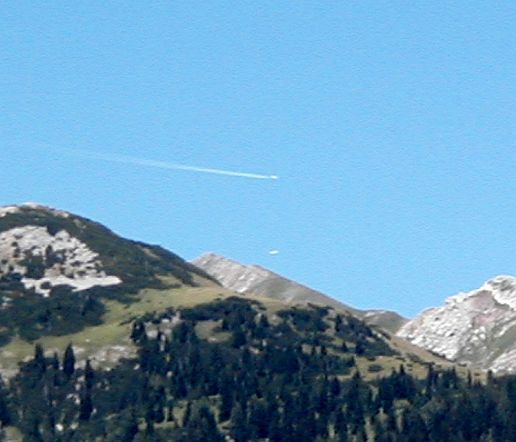 This unusual picture, taken on a sunny afternoon in 2003 near the Austrian village of St. Anton, shows two distant airplanes illuminated by the Sun and moving in opposite directions. While one of the planes has a clearly distinguishable contrail, the other craft is flying at an altitude where temperatures are not low enough for the humid air of the jet exhaust to condense. The picture is slightly out of focus because the camera had to be grabbed from a bag and pointed in the right direction before the lower plane disappeared behind the horizon.